Fresh from announcing important new distribution deals in the US and Burma, the BBC’s international television news channel, BBC World News, is unveiling a dramatic new look next week when it re-launches from new studios in central London. The channel will feature a refreshed line-up of programmes and presenters, and will be investing heavily in additional newsgathering capacity around the world. From 12:00 GMT on Monday 14 January the channel will be broadcast from new state of the art High Definition studios in the BBC’s new London headquarters, the redeveloped Broadcasting House. 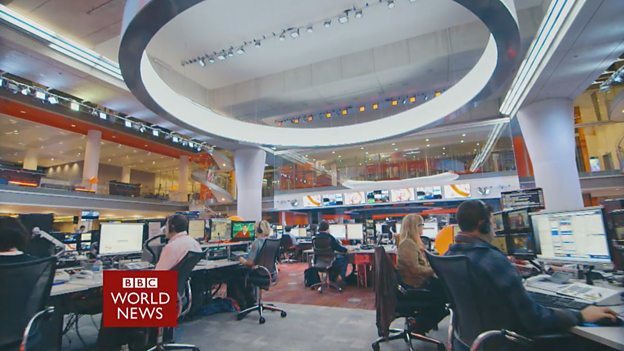 BBC World News is the first English language channel to go live from the new building. BBC World News journalists will be at the heart of ‘the world’s newsroom’ where the BBC's UK and international journalism teams have come together to provide output across digital, radio and television and 27 different languages, reaching an audience of 239 million people around the world each week. Eventually, 6,000 people - more than a quarter of all BBC staff - will be based in Broadcasting House, one of the world’s largest broadcast complexes. The channel will also debut new on air talent including Yalda Hakim, one of Australia’s brightest international journalists, who has joined the channel as a current affairs correspondent and presenter for a new weekly current affairs programme. BBC World News has also announced that long time BBC News presenter and reporter Jon Sopel is joining the channel to present Global with Jon Sopel, a new weekday international news programme. BBC World News and bbc.com/news, the BBC’s commercially funded international news platforms are owned and operated by BBC Global News Ltd, part of the BBC News Group. BBC World News, the international 24-hour news and information channel is available in more than 200 countries and territories worldwide, and over 350 million households and 1.8 million hotel rooms. The channel's content is also available on 151 cruise ships, 40 airlines and 23 mobile phone networks. For further information on BBC World News visit bbc.com/tvschedule. bbc.com is one of the most respected brands on the internet, and the global news content on the site offers up-to-the minute international news and in depth analysis to more than 58 million unique users each month.